Are you having issues with your water heater? At Mike Tilton Quality Plumbing & Heating, we offer our residential and commercial clients a full line of water heater repair, replacement, and installation services. Our certified staff can repair or replace any make and model you own to ensure your equipment is running at an optimal level. Our services will exceed your expectations when it comes to plumbing and water heater replacement. We offer tankless water heating systems and a variety of energy saving solutions that will keep your wallet full and your home comfortable. These prices are good if there are no issues with the vent piping, water and/or gas connections. Prices include disposal of old water heater. If vent piping on water heater needs replacing, you can expect that to cost approximately an additional $200. This will cover up to a 10’ run. When longer runs of pipe are required, we will quote it individually. If the gas valve or flex line should need repaired or to be replace, you can expect an additional $55 each. If the water shut off valve on the heater needs replacing, this will also add $55. Prices are good if there are no issues w/water shut off valves. If the main water valve on the heater needs replacing, this will add $55. A new and very popular option in home water heating is the tankless water heater system. These heaters do not store water in a steel tank like traditional water heaters, but rather they heat the water as you use it and only as you use it. This saves money because the tank type heaters have to cycle regularly to keep the water in the tank hot, while the tankless heater sits idle until hot water is called for. These heaters operate very efficiently. The hot water will run endlessly with a tankless water heater because there’s no tank limiting the capacity of the hot water available for use. Those heaters also have a longer warranty because the water doesn’t sit in a steel tank susceptible to rusting due to constant contact with water and leaking. The water only sits in copper piping which can last decades. If you are interested in a tankless water heater, see below for approximate installation options and cost examples. Installing tankless heaters vary greatly based on circumstances. We will briefly describe a few common types of install and approximate costs involved. There are also different flow rates for these heaters. The Rennai heaters we use most often are the RL75 and RL94. The numbers represent the gallons per minute (gpm) these heaters put out. The 75 stands for 7.5 gpm and the 94 stands for 9.4 gpm. We can assess your homes demand and recommend the correct heater size for you. Tankless heaters also come in 2 types, interior and exterior. With interior tankless heaters you will need to run a vent through your roof similar to the tank heaters, but the tankless vent system is a different type and the tank type heater vent piping cannot be reused. An exterior install tends to be cheaper because there is no vent to install but that’s not always an available option. Tank heaters in attics make for perfect tankless install replacement conditions. The vent run is usually short, and the water and gas piping is usually available to be re-roughed easily. To remove a tank type heater in the attic and replace it with a tankless usually costs in the $2,500-$3,100 range. Replacing a tank type heater in an interior room or closet with a tankless usually costs a couple hundred more. Any tank type heater can be replaced with a tankless heater, just give us a call and we can go over options and pricing with you. 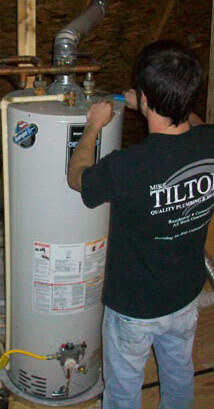 For water heater repair and replacement services you can count on, call Mike Tilton Quality Plumbing & Heating today!